If you normally ride a sports bike then I'd like to commend you for reading this far at all. 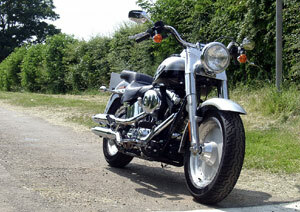 Because there are few, if any, bikes that polarise opinion more than Harley Davidsons do. And if you're a sportsbike rider then you probably don't really see the point of a Harley. I mean, they're immensely heavy, incredibly slow, are cursed with atrocious handling and massively overpriced. Your sportsbike will have cost half the price and will outperform any Harley you can think of in any way you can imagine. But that isn't really the point either. Let me take you back a few weeks. I'd just ridden up to the Midlands on a Ducati 800SS. the previous day I'd taken a GSX-R 750 back to Suzuki with a set of comprehensively knackered tyres after a hard (but very rewarding) day's track work. If you cut me in half you'll find "Sportsbike rider" written through the middle of me. The idea of bringing a Harley down was amusing but that was about it. Seeing it for the first time brought all those prejudices to the fore. It was immense. But very pretty in a shiny bauble sort of way. The first few minutes were dreadful. My legs felt all wrong, the controls took some getting used to and the gearbox was like stirring a bag of spanners with my foot. The brakes were appalling and I was not having fun. Then I started to see how other people were reacting and I just relaxed a bit. Suddenly the riding position stopped feeling un-natural, the brakes improved once I used the back as much as the front (so that's why the pedal is so big) the secondary controls seemed a little less odd and the weight disappeared. The gearbox, however, remained horrible. But with 1455cc beneath you, actually gears don't matter that much. And I started to get it. For the first time ever, I began to understand what people see in Harleys. Now as the journey wasn't going to be at the normal sort of pace, I started thinking of things I had always thought about Harleys and attempted to prove them right or wrong. So here are a few examples. Harleys don't handle. Actually they do. Not in a razor sharp sportsbike way, but in a very predictable, friendly way that encourages smooth and progressive riding rather than point and squirt. The limiting factor, at least in the dry, seems to be ground clearance for the simple reason that there isn't very much. Everything that touches down folds out of the way but it happens rather sooner than you might expect. Nonetheless, with a bit of forward planning and good road positioning the Fat Boy could be hustled along at a pretty decent pace. Harleys are slow. Well, yes they are in outright terms. But like I said before, the Fat Boy covered ground quite surprisingly quickly and accelerated very nicely as well. Overtakes are a doddle - just twist and go - and all day cruising at sufficient speed to attract unwelcome attention is a perfectly viable option should you choose. Harleys are heavy. That's an understatement. The Fat Boy weighs in at an incredible 323kg empty. It's maximum permissable weight is 575kg. That's well over half a ton loaded or two GSX-Rs empty. But all the weight is so low down that it doesn't really matter. It isn't a struggle to hold it up at the lights or even to wheel it around, and once it's moving properly then the weight vanishes anyway, at least in the dry. But the weight isn't just because Harley Davidson have been lazy or because the bike is old fashioned. It's there because, quite simply, quality is heavy. The chrome plating (there's a lot of it) is so thick that it almost seems an insult to call it plating at all. There is no plastic anywhere to speak of - the saddle is leather and everything else is either thickly painted steel or chrome. You could, I believe, pick the bike up by its mudguards. Assuming, of course, that you could lift 323kg in the first place. Harleys are expensive. Yes, they are expensive, but they also enjoy some of the lowest depreciation of anything you can buy. The Fat Boy may be twice as expensive as your Japanese replica, but in five years time it will be worth about ten times as much. Plus the sheer quality of the bike makes the price seem more reasonable somehow. 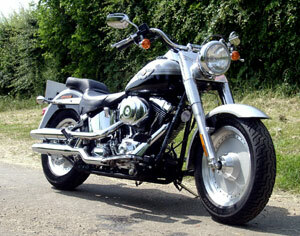 There is certainly something about a Harley - probably any Harley at all - that no other bike can offer. It's the machine that every non-biker recognises and admires. It has an incredible presence, not just through sheer size but through its unmistakeable identity and image. There are many imitators, some of which are extremely good when taken in isolation, but alongside the real thing they simply look like what they are, in relative terms at least. Cheap copies. There are many features of a Harley Davidson that are unique. Some are great and classic - the "potato-potato" noise, for example. Some are less great, like the BMW-esque indicators that saw me indicating left instead of sounding the horn and right instead of starting the motor. Some are beautifully thought out, like the mechanically locking sidestand that is held down by the weight of the bike and can't spring up by mistake, no matter what. Or the "Harley Davidson" badge on the speedo that lights up at night. You could never be mistaken about what you're riding and that in itself changes the way you ride. You sit back and relax. You change up early because you might as well get it out of the way. You enjoy the ride in a totally different way to usual. And you just know that you could do it all day and still not be tired. The bike will go on for 100,000 miles before it needs anything at all. Or it feels like that anyway. Something your sportsbike may not be able to claim, I suspect. Up until now, while I'd always known that God rode a vee twin I thought it was probably European. But thinking about the mileage He has to cover, I wonder if it might just hail from across the pond instead. never thought I'd say it but here I am. I really enjoyed my time with the Fat Boy. I enjoyed the total change of riding style and the completely different way that other road users behaved towards me. I grinned a lot, even when I got caught in a cloudburst wearing jeans, open faced helmet, sunglasses and short jacket. I gave up worrying about it and just smiled at people, who all seemed to smile back. It's that sort of bike, you see. Except that I was more frightened when the back stepped out on a greasy roundabout than I ever was on the GSX-R 1000 around the Nurburgring. With me and a full tank on board there was something over 400kg going sideways under me, and I did not enjoy it one little bit. Yes, I caught it, but more by luck than anything else I think. Must have looked good, though. But on balance I didn't want to give it back. I even found myself cleaning it almost every day. 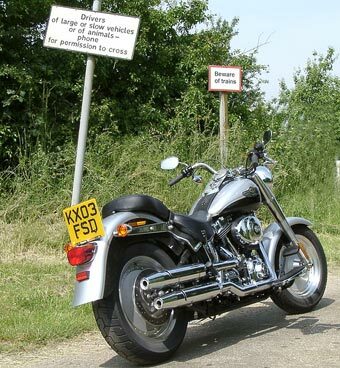 So if you've got even a slightly open mind, get yourself down to a Harley dealer and get a test ride. Short shift up through the box, sit back, relax and just enjoy it. But don't worry if you don't get it - some people just never will. 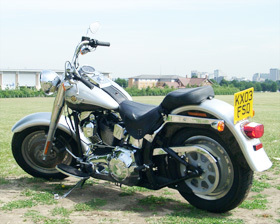 Read external Harley Davidson Fatboy reviews on Ciao.